UPDATE: The exhibit has been extended beyond its original end date of May 13, 2018. It is now on display through May 28, 2018. An exhibit that’s as much about beauty and art as it is about education is now open at Lauritzen Gardens in Omaha. “Metamorphosis: From Reclaimed Plastics to Works of Art” is on display through May 28, 2018. Most exhibit pieces are indoors, making it a perfect destination in the winter. 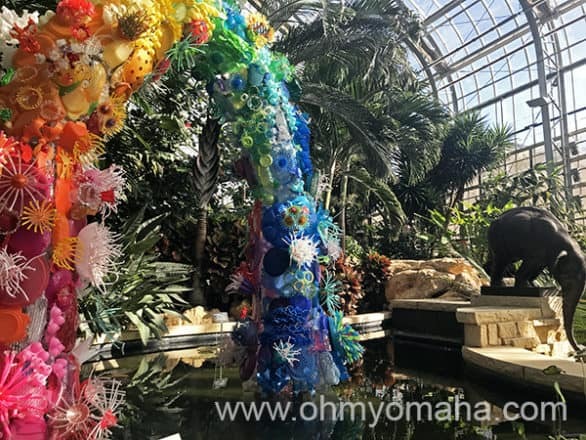 I received complimentary admission to Lauritzen Gardens to share the experience with you. 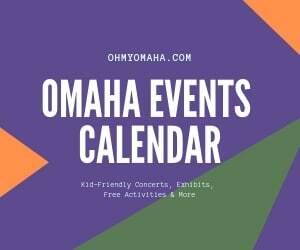 If you’ve never taken your kids to visit Lauritzen before, be sure to read this guide to taking kids to Lauritzen Garden. There 18 pieces from birds to aquatic creatures to a rainbow in this exhibit. Two artists, Aurora Robson and Sayaka Ganz, created most of it (a third artist, Jim Merz, worked with Ganz to create the Luminariales). The exhibit has a message of environmental stewardship and is thought provoking. You might not look at plastic the same way again. 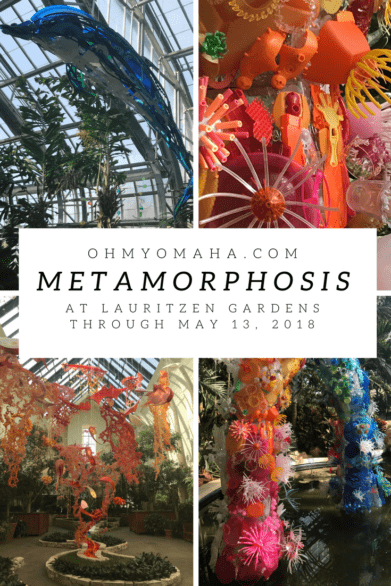 “Metamorphosis: From Reclaimed Plastics to Works of Art” is at Lauritzen Gardens in Omaha through May 13, 2018. The fun part is identifying the objects used to create each piece. There’s a free scavenger hunt that’s good for encouraging you to look even closer at each piece. My youngest loved the scavenger hunt, but also was frustrated with it. Trying to find about 60 objects while not being able to read the list objects was an obstacle. It didn’t stop her, but it slowed her down. 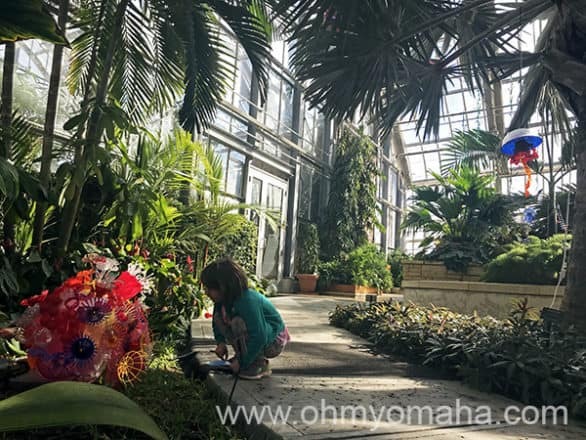 On a scavenger hunt inside the conservatory at Lauritzen Gardens. Each of us had our favorite pieces. My kids were interested in the marine animals that Ganz so creatively created out of plastic. My son loved the large blue whale in the tropical house of the Conservatory. The phoenix was a close second for him. My daughter liked the dolphins, which were floating near some pretty neat jellyfish. 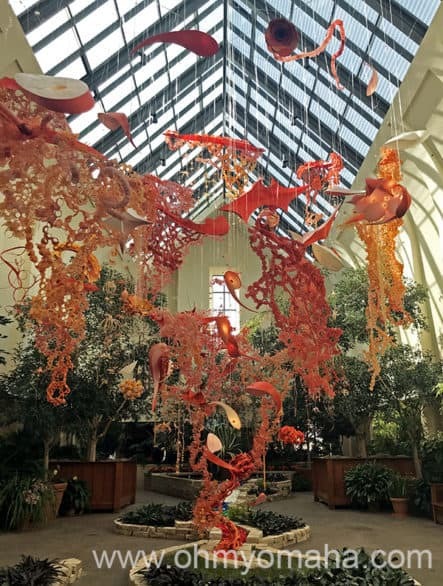 The vortex by Aurora Robson is located inside the Floral Display Hall at Lauritzen Gardens through May 13, 2018. Me? I was blown away by Robson’s vortex in the Floral Display Hall. It was gorgeous and huge and kept drawing me in. OMG! This looks amazing! It’s like a Chihuly installation, only instead of Venetian-style blown glass, it’s upcycled plastic! 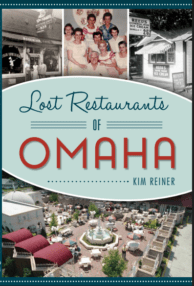 I need to make plans to visit Omaha and see this before it ends in May! It’s totally vibrant like Chihuly glass. You should visit this spring and see it! If you’re a Chihuly fan, there’s an incredible installation at Joslyn Art Museum you need to see here, too. This #art looks AMAZING! I love how it’s themed throughout the gardens! They really did find ways to fit the art into the setting.